Learn about the West Highland White Terrier’s history, diet, and health to discover what makes this breed unique! A true Scottish breed, the West Highland White Terrier – also known as the Westie – was originally developed from the Cairn Terrier by the Malcolms of Poltalloch in the Mid 19th century. They purposefully bred a white dog to make it easier to see when hunting on the moors. After time, the West Highland became more distinct from its Cairn ancestors and was recognised by the Kennel Club in 1907. Interesting Westie fact: Some say that the Malcolm’s change of direction over the preferred colour of their terriers was due to a hunting accident, where one of their dogs was mistakenly shot instead of a fox. The Westie is a solid and robust small dog; well-muscled, deep chested and compact with wide set dark eyes and small erect ears. The West Highland White Terrier always has white fur and a double coat – a short soft undercoat and a coarse, moderately long (approx. 5cm) outer coat. When it comes to Westie grooming, weekly brushing is ideal to help keep their coat clean and their skin healthy. Full of character and mischief, the West Highland White Terrier can be strong-willed and independent. Active and athletic, hardy and game; they are not a lap dog, despite their looks. The West Highland White Terrier puppy grows quickly during the first 10 months. They require a diet that will not only supply sufficient energy for their active personality, but one that will also provide all the nutrients necessary for ideal growth and development, such as proteins and a balance of minerals. Supporting the needs of the growing puppy also includes nutritional support for the natural defences and digestive system which are still developing. 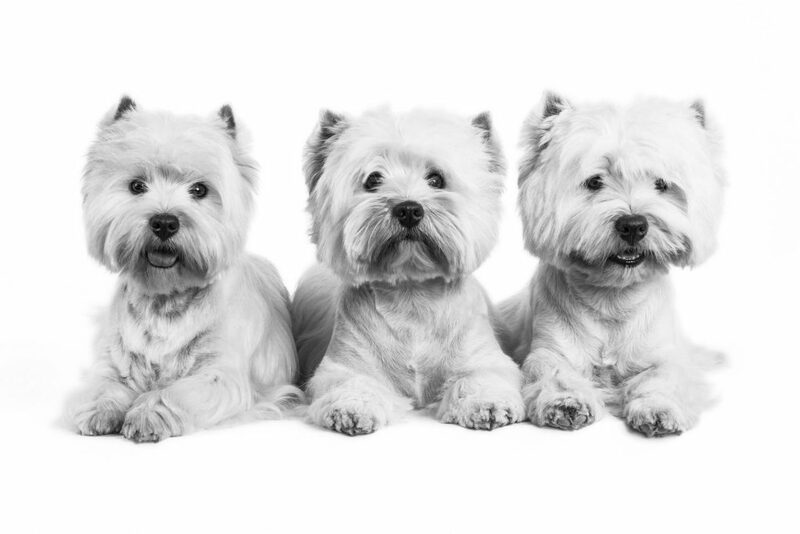 This breed is known best for its rough textured white coat, and keeping it in good condition requires not only dedicated grooming, but also the right nutritional support – especially when combined with the Westies delicate skin. When searching for the best food for Westies, specific amino acids and an adapted protein content are key for the skin and coat, alongside selected omega fatty acids sourced from a combination of fish, flax and borage oil. Additionally, an exclusive complex of vitamin, amino acids and minerals work to support the skins natural barrier role. Like many smaller breeds, dental concerns can affect the West Highland White Terrier. Therefore, a kibble that encourages crunching and includes calcium chelators to help reduce tartar formation is undoubtedly a benefit. Ideal adult West Highland White Terrier food: ROYAL CANIN® West Highland White Terrier Adult.